SCUA Department Head, Petrina Jackson, has been elected to Society of American Archivists Council! She will serve a 3-year term, 2018-2021. Join us in congratulating her! Petrina triumphant after putting together our new mannequins, she had some help! (Photo by Rachel Seale). Picture of Special Collections & University Archives, left-right: Brad Kuennen, Caitlin Moriarty, Shaina Destine, Petrina Jackson, Olivia Garrison, Rosie Rowe, Matt Schuler, & Amy Bishop (photo by Jesse Garrison). I was invited this week to be a guest Instagrammer for the Society of American Archivists (SAA). 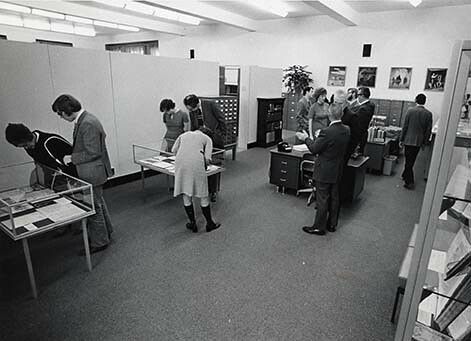 Founded in 1936, SAA is the oldest and largest national professional association for archives and archivists in North America. Hello! I’m Rachel Seale, the outreach archivist at Special Collections & University Archives at Iowa State University. This week is #homecomingweek2017 for us & we have some fun events planned, so stay tuned! We don’t have an Instagram account but do visit us on Facebook @SpecialCollectionsISULibrary & on Twitter @ISU_Archives. I’ve been an SAA member since 2010 and have served on the Security Section (2013-2016) and currently serve on the Committee on Public Awareness. Special Collections & University Archives doesn’t have an Instagram account at this time, so please make sure to follow Society of American Archivist’s Instagram (@saarchivists). This is a great time to be a guest Instagrammer, this month is American Archives Month and Homecoming Week for Iowa State University, so we should have some great posts! The President of the Society of American Archivists, Kathleen Roe, recently called for archivists to come up with a 5 word phrase for engaging people in conversations about archives and archivists. Here at Iowa State University, we’ve decided to focus our five word phrases on why archives are important and what the ISU Special Collections Department can do for you. Here are the options – vote for your favorites and/or add your own! Last week, thousands of archivists descended upon Washington, D.C. for a joint annual meeting of the Council of State Archivists (COSA), the National Association of Government Archives and Records Administrators (NAGARA), and the Society of American Archivists (SAA). Every four years these national organizations convene in our nation’s capital to learn and share knowledge. I was able to attend the conference as a member of SAA, as were assistant department head Laura Sullivan and one of my fellow project archivists, Stephanie Bennett. The following are, in my opinion, some highlights of the conference. The conference program for the 2014 joint annual meeting of COSA, NAGARA, and SAA. Attending educational sessions is one major reason we attend conferences. The sessions that struck me the most this year were “Getting Things Done with Born-Digital Collections,” “Talking to Stakeholders about Electronic Records,” and “Taken for Granted: How Term Positions Affect New Professionals and the Repositories That Employ Them.” The first two discussed the challenges of electronic records, which is a hot topic in the archives profession right now. The session on term positions was particularly relevant to me since I am currently in a term position, meaning that my employment here ends after a certain amount of time. That session discussed the positive and negative impacts of short term positions, as well as possible solutions and compromises to the problems term positions create. Another big reason we attend conferences is to meet other archivists and to network. Happily, I found two friends from grad school right off the bat, and it wasn’t long before I found other IU-Bloomington alumni, including those that I’d never met. I also met lots of people who graduated from other schools, and it was great to learn about different experiences and their current work. I even got to meet some famous people in the world of archives, which was really exciting for a new professional. In the end, it was wonderful to catch up with old friends and meet new. Yours truly in the Library of Congress reading room during the All-Attendee Reception. A couple other highlights of the conference were the All-Attendee Reception and a variety show, “Raiders of the Lost Archives.” This year’s reception was held in the Library of Congress Great Hall in the Thomas Jefferson Building. That is one of the most beautiful buildings I’ve ever seen, and absolutely lives up to its hype. They opened the reading room up to us, which is only opened to the public twice a year. I could not have been more excited to be there. After the reception, a sketch show was performed – of which I was a part – back at the conference hotel. It was a reboot of “Raiders of the Lost Archives,” which was a sketch show performed in the 1980s and 1990s. The shows included skits and songs full of archival humor (yes, it’s a thing), and it was a blast to be involved. This year’s recording may be available on YouTube in the near future, but don’t judge my performance too harshly – keep in mind we had very little rehearsal and it was at the end of a long day. But really, overall I think the show went well; we received some wonderful comments and it was good fun. The joint meeting this year was a great experience, and I hope to attend next year’s SAA Annual Meeting in Cleveland, Ohio!